Beautiful wood grain, standout hardware, and sleek lines all come together to make this singular dresser and mirror combination. The traditional style is sophisticated enough to earn it a place in the master bedroom, but it's simple enough that it won't overpower a guest suite. Revel in the rich tones and unique finish, which really make the natural wood stand out. 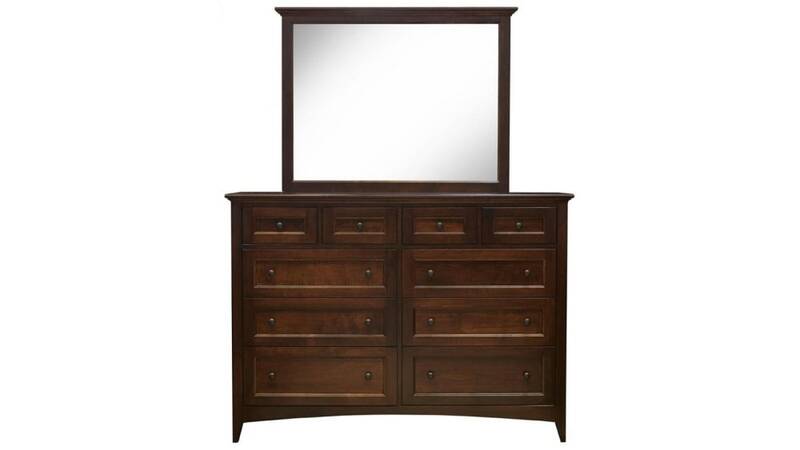 You can get dressed, look yourself over, and add any final touches, all in front of this stunning maple dresser and mirror. Beautifully crafted from solid maple wood. A catalyzed finish in a stunning mid-tone helps to protect the furniture. Plenty of drawers allow you storage for clothing. Four small drawers along the top provide easy access to everyday items. A large framed beveled mirror is fixed atop the dresser.